Situated fantastically in the middle of the Great Indian Desert, the Thar Desert, Bikaner is one of the most important and historical cities in Indian state of Rajasthan. Famed as the Camel Country, the desert city of Bikaner is home to several historical monuments and places of tourist interested, providing awesome tourism experience to relish for lifetime. Formerly the capital of the princely state of Bikaner, this beautiful desert city was founded in 1486 by Rao Bika, the son of Rao Jodha who founded Jodhpur. This historical city has been developed into the fourth largest city in the state of Rajasthan. Bikaner offers a wonderful tourism opportunity to travelers coming from the different parts of the world. The desert, the sand dunes, the forts, the monuments, the temples, the camel safari rides, the havelis, the gardens, the lakes, the heritage hotels, unique culture & tradition, vibrant fairs & festivals … there are so many things within the city of Bikaner for which the entire Rajasthan is internationally famous. Hence, exploring Bikaner and its surroundings will indeed give a delightful experience of complete Rajasthan tourism to cherish for the life time. The historical city of Bikaner exhibits its ancient opulence through magnificent forts and palaces, superbly constructed in red sandstone. The Junagarh Fort, also called Old Fort, in Bikaner is a key attraction in the city attracting the attention of tourists with its spectacular architectural styles and arresting beauty. The stunning architecture of the Junagarh Fort will never fail to lure you on your Bikaner sightseeing tour. The fort complex consists of several other attractions and structures including different gates, temples, palaces, museum, and havelis. Outside the fort limits, there is the magnificent Lalgarh Palace, built in Indo-Saracenic architectural style. Consisting of beautiful drawing rooms, guest suites, grand halls, smoking rooms, lounges, pavilions, cupolas and a large dining room; the Lalgarh Palace Complex features spectacular pillars, elaborated fireplaces, intricate latticework, filigree work, Italian colonnades. There is a beautiful palace within the Lalgarh Palace complex namely Karni Niwas which houses the grand Durbar Hall and a beautiful indoor swimming pool. There is also a museum situated inside the Ganga Niwas within the palace complex. Here guests can see the beautiful miniature paintings related to Bikaner school of art, Terracotta wares, and armors. A former residential palace built by Maharaja Ganga Singh --- the rule of the former state of Bikaner, the Laxmi Niwas Palace is an architectural delight in the city. Converted into a luxury hotel, this elegant and historical palace can be a great attraction on the itinerary of your Bikaner city tour in Rajasthan. On our Bikaner city tour in India you can visit and explore several places of interest like Deshnoke Karni Mata Temple, Mukam Bishnoi Temple, Bhandasar Jain Temple (famous for its beautiful leaf paintings, stunning frescos, and ornamented mirror work), Gajner Palace (now a heritage hotel), National Research Center on Camel, Sand Dunes (by camel safari rides), Rampuria Haveli, Devikund Sagar Royal Cenotaphs, Gajner Wildlife Sanctuary, Kote Gate, Shiv Bari Temple, Kodamdeshwar Temple, Shri Laxmi Nath Temple, Prachina Museum (situated within the Junagarh Fort), Ganga Golden Jubilee Museum, Sadul Singh Museum (situated in the Lalgarh Palace), and Abhivyakti (perfect place to go souvenir shopping). 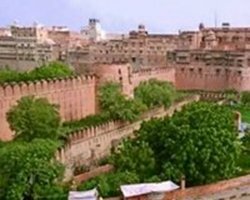 On the whole, together with city attractions and attractions around the city, the city of Bikaner offers a great tourism experience to cherish for lifetime. The beautiful and historical city of Bikaner is well-connected with other Indian cities. Tourists can easily reach here by roads, rails, and flights. Jodhpur is the nearby airport to access the city of Bikaner. By Air: Bikaner city has a Domestic Civil Airport called Nai Airport. The airport is not fully functional hence the most convenient way to reach Bikaner by flight is the Jodhpur Airport which is connected by many Indian cities. From here travelers can hire taxies or take car rental to reach Bikaner. By Rail: Bikaner is well-connected by rail with major cities like Delhi, Kolkata, Chennai, Alwar, Mumbai, Kanpur, Agra, Jalandhar, Baroda, Guwahati, Jaipur, Surat, Gurgaon, Puri, Bhubaneshwar, Bilaspur, Hyderabad, Coimbatore, Trivandrum, Chandigarh, Kota, Kollam, Jammu, Jodhpur, etc. By Road: The city of Bikaner is well-served with roads. It is well connected with cities like Jaipur, Alwar, Jodhpur, Jaisalmer, Delhi, Agra, Ludhiana, Ambala, Bhatinda, Panipat, Haridwar, Ahmedabad, and several other cities and towns.